The wellspring to the future global growth in tourism is a commitment toward good policy and strategic planning. 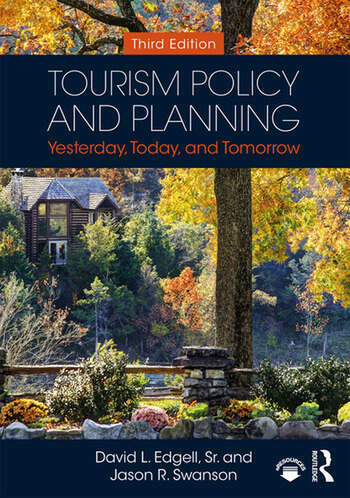 Tourism Policy and Planning: Yesterday, Today, and Tomorrow offers an introduction to the tourism policy process and how policies link to the strategic tourism planning function as well as influence planning at the local, national, and international level. A new chapter on policies regarding terrorism and its impact on tourism. New and updated content on managing sustainable tourism, obstacles and barriers to international travel, and strategic tourism planning. New case studies based on established and emerging markets throughout to illustrate real-life applications of planning and policy at the international, regional, national, and local level. New end of chapter summary and review questions to consolidate student learning. Accessible and up to date, Tourism Policy and Planning is essential reading for all tourism students. David L. Edgell, Sr. is a professor of trade, tourism, and economic development and a senior professor of graduate studies in sustainable tourism at East Carolina University. He has authored 11 books and over 100 articles, has served as U.S. Under Secretary of Commerce for Travel and Tourism, and was the first Commissioner of Tourism for the U.S. Virgin Islands. Jason R. Swanson is a professor of hospitality and tourism at the University of Kentucky and is the author of two books on tourism and many articles on tourism-related issues. Professor Swanson also teaches at international universities, conducts important research related to tourism policy and planning, and provides international consulting services.